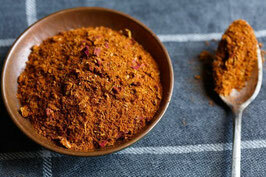 is a spice blend common in North African cooking, and features especially heavily in Moroccan cuisine. The name in Arabic means "head of the shop," and literally refers to the best spices the store has to offer. While it used to be only available at Middle Eastern grocers, specialty and well-stocked grocers now carry this popular spice blend. Blended in NZ from local and imported spices. Contains Turmeric, Paprika, Cinnamon, Cayenne, Ginger , Nutmeg, All Spice, Cardamom, Coriander, Fennel, Cumin, Salt, Pepper and Rose Petals. Now available here as well. Packed by 100g, 500g and 1kg.